415 W. Washington, 721 N. Main, MichCon site – future greenway? Ann Arbor city council meeting (May 7, 2012) Part 1: In Part 1 of this council meeting report, The Chronicle has collected those agenda items and discussion that relate to land use and open space, which was one of two dominant themes of the meeting. The other major theme was public art, which will be included in Part 2 of the report – along with other items not related to land use. In connection with different agenda items, the council discussed the future of three major parcels within the city, two of which are city-owned: 415 W. Washington and 721 N. Main, and the MichCon site near Broadway bridges. First the council heard an update on the possible future of the city-owned 415 W. Washington property, located across from the Ann Arbor YMCA, which opened in 2005. The Y replaced the old Ann Arbor Technology Center, which had been the home of the 555 Nonprofit Gallery and Studios, along with independent artists and musicians, who rented space at the center. It burned in the course of a 2003 demolition. The 555 Nonprofit Gallery and Studios went on to re-locate in Detroit. The group has some experience re-purposing buildings as space for artists, recently hosting a fundraiser for an additional property it has acquired – the 3rd Police Precinct in southwest Detroit. Artists can rent literal jail cells there as work space. 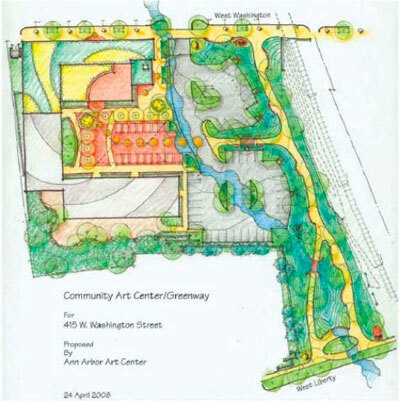 On Feb. 1, 2010, the Ann Arbor city council had established a task force – consisting of greenway advocates and members of the arts community – to explore the future use of the 415 W. Washington property. The Ann Arbor Arts Alliance was the group identified to represent the arts community interests. Now, the 555 group appears ready to take responsibility for the arts portion of planning for the site. That’s the portion that entails re-using the existing building on the site, which is located in the Old West Side historic district. Carl Goines, a representative of 555, addressed the council on Monday night. Goines had co-founded the group 10 years ago in the tech center. Goines described how an investment of around $45,000 is needed for surveying and environmental analysis of the 415 W. Washington site. That investment would be required whether the building is preserved or demolished, he said. Mayor John Hieftje indicated in his comments at the meeting that he’d be willing to give the group perhaps a year to establish a viable way to re-purpose the building, but also indicated an eagerness eventually to apply to the Michigan Natural Resources Trust Fund for a grant to develop the entire parcel as a park. If the 555 group could not find a way to rehabilitate the structure within a reasonable time, Hieftje indicated a willingness to pursue the option of asking the city’s historic district commission for permission to demolish the structure. The other city-owned parcel discussed by the council was 721 N. Main, former site of a city maintenance yard. 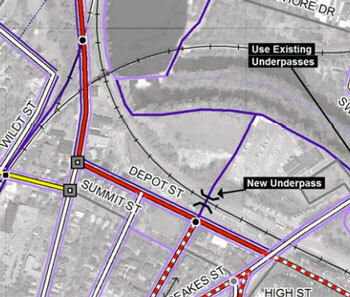 That came in connection with a council resolution to establish a task force to study the North Main corridor, and deliver a report in a year’s time, by July 31, 2013. Earlier than that, by the end of 2012, the task force is supposed to provide a recommendation on the use of 721 N. Main. The city has an already-approved grant from the Federal Emergency Management Agency (FEMA) to pay for demolition of two buildings on the site – but not the main building. The 721 N. Main parcel will also likely be part of a Natural Resources Trust Fund grant application by the city in the spring of 2013. 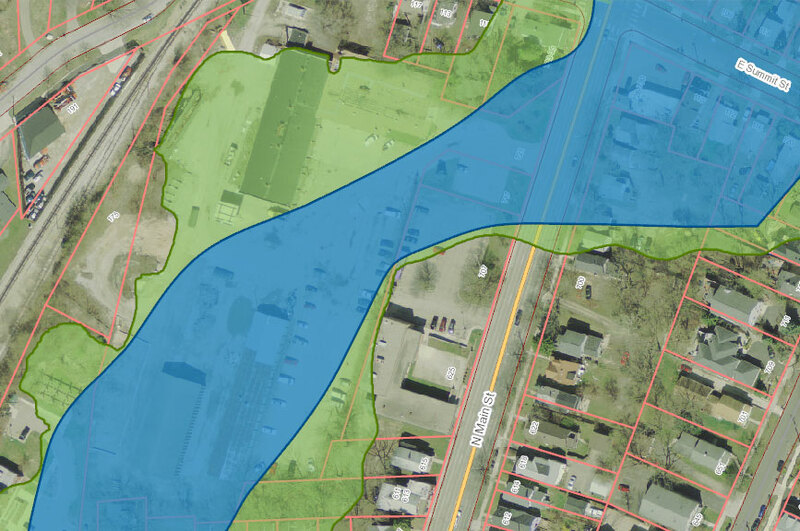 The task force is also supposed to provide a recommendation on the future use of the MichCon property, between the Amtrak station and the Huron River. MichCon is currently undertaking an environmental cleanup of the land, and the standard to which MichCon remediates the parcel will depend on its intended future use. Hieftje has been clear about his preference – that the city acquire the land for a park. A possible source of funds the city could use for acquisition of such a park would be money generated by the open space and parkland preservation millage. By administrative policy, a third of the revenue from that millage is overseen by the land acquisition committee of the city’s park advisory commission. The council confirmed a new appointment to that commission at Monday’s meeting – Ingrid Ault, who replaces the term-limited Gwen Nystuen. The other two-thirds of the millage revenues – for preservation of land outside the city as a greenbelt – is administered by the greenbelt advisory commission. And notice of two upcoming reappointments to that body was also on the agenda – for Catherine Riseng and Peter Allen. Allen is a real estate developer, who might have alternatives in mind for MichCon’s property that include more than just a park. But the history of the planning for the site dates back more than just two years. 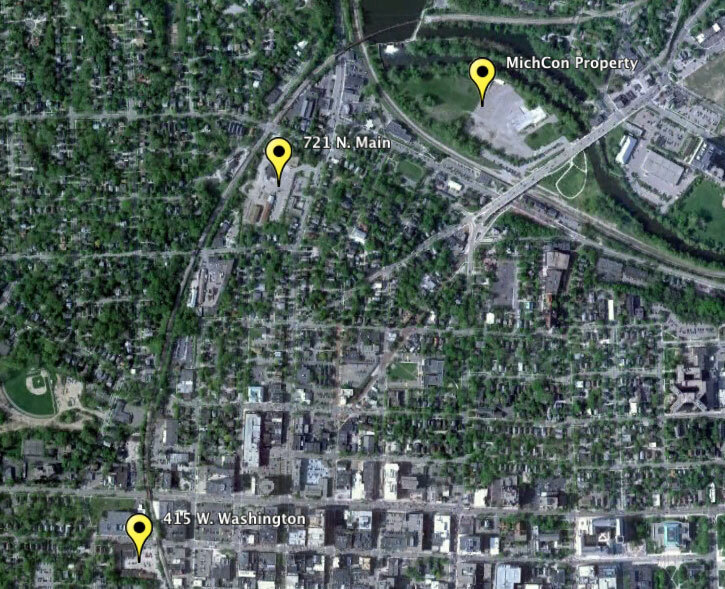 Currently, the part of the parcel not occupied by buildings is used for surface parking in Ann Arbor’s public parking system. The lot offers 161 spaces, and generated $160,274 for 49,818 hourly patrons for the first nine months of fiscal year 2012 – that is, through March 31. Based on the first three quarters of FY 2012, the annual revenue from 415 W. Washington’s parking lot can be estimated at $214,000 annually. The Ann Arbor Downtown Development Authority operates the public parking system under contract with the city of Ann Arbor – a contract that stipulates 17% of gross parking revenues be paid directly to the city. So currently, the surface parking lot at 415 W. Washington could be estimated to provide about $36,000 annually to the city of Ann Arbor. Another rationale for maintaining the current structure has been provided by a variety of artists, artist organizations and other non-proﬁt entities such as Kiwanis, many of which have expressed a desire to maintain the building for use by their respective organizations. Beneficial use of the site. … Preference will be given to proposals that incorporate a use (or uses) that provides a publicly available service to the community, for instance, building space that may be used for public meetings and civic or cultural events. Additional consideration will be given for the development of dwelling units affordable to downtown workers earning between 60% and 80% of Area Median Income (AMI), as defined by the U.S. Department of Housing and Urban Development (HUD). Public greenway linkage. The floodway portion of the site should be reserved in some manner as open space for the Allen Creek Greenway. … The proposal should include provisions for long-term maintenance of the public elements by the applicant. Old West Side Design Group: This proposal called for construction of a 3-story artist loft and live/work building totaling 24-36 units with above grade-level parking. 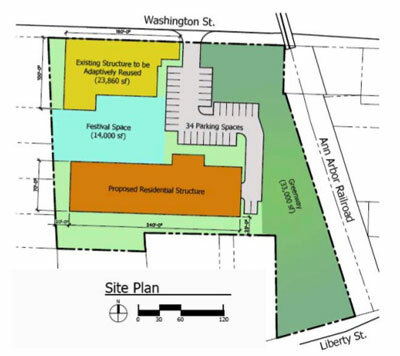 The building, which would contain a minimum of 5-8 affordable units, would be located south of the main building on land currently occupied by garage structures. It would be designed for a LEED Silver rating or higher. A 24-unit residential condominium and commercial building is proposed on the adjacent 318 W. Liberty, to be developed under a separate site plan by members of the OWSDG proposal team. Morningside: Construction of a new five-story, 52-unit condominium building with 48 parking spaces on the grade level under the building. Second floor residences are proposed for artist live/work space. Units would be priced in the mid-$200,000 range. The building, which would be designed for LEED Gold certification, would be located south of the main building on land currently occupied by garage structures. Ann Arbor Art Center: Renovation of the 415 W. Washington building and garages into a community arts facility, to be owned by the Art Center. The Art Center would occupy approximately 13,000 square feet and rent or lease the remaining space to art groups and individuals. Membership on the RFP review committee was as follows: Christine Brummer (Old West Side Association), Chris Easthope (now 15th District Court judge and then Ward 5 city council member), Sue McCormick (then director of public services with the city of Ann Arbor), John Mouat (then as now, an Ann Arbor Downtown Development Authority board member), and Scott Rosencrans (then a member of the city’s park advisory commission). Notwithstanding these positive elements, the Committee finds that no single proposal is able to satisfy all of the site objectives and requirements of the RFP on its own merits. This evaluation is described in the findings below, followed by recommendations for the next steps in the site redevelopment process. A publicly-owned greenway along the existing floodway. Renovation of the 415 W. Washington office building for an arts and/or civic use. Removal of the garages behind the office building. Construction of a new multi-family or live-work residential building at the southwest corner of the site. Pedestrian and vehicle connections to both Liberty and Washington streets. City council should provide each of the three proposers an opportunity to amend their proposal to respond to the revised site objectives and to provide for collaboration between the parties. The charge of the advisory committee should be extended to review the amended proposals and make its recommendation to city council by March 16, 2009. The city council did not act in the fashion described by the RFP review committee. 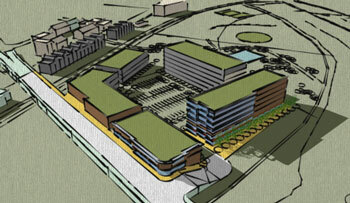 Instead, the city council eventually moved ahead with its Feb. 1, 2010 resolution on the 415 W. Washington site. That resolution could be fairly described as taking the concept from the Ann Arbor Art Center’s RFP response and starting a community-based process to explore its realization. The Greenway Arts Committee established to engage in the “innovative process” included: mayor John Hieftje, Carsten Hohnke (Ward 5), Margie Teall (Ward 4), Christine Schopieray (the mayor’s administrative assistant) on behalf of the city council; Joe O’Neal and Jonathan Bulkley for the Allen Creek Greenway Conservancy; and Tamara Real, Susan Froelich and David Esau for The Arts Alliance. 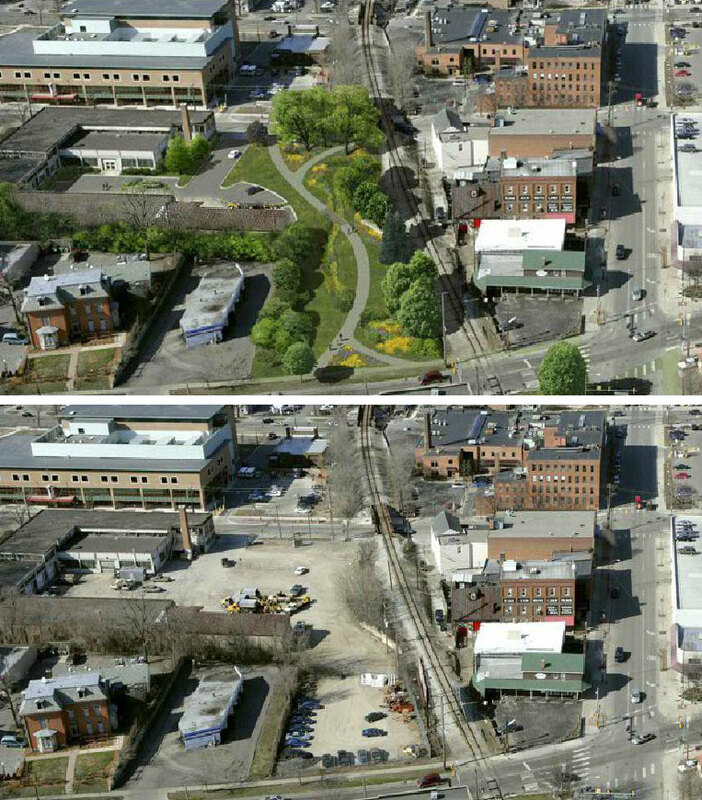 A year ago, at its April 4, 2011 meeting, the council received an update on the process. Esau of the Arts Alliance gave the presentation for the group. Highlights of the work included a report on focus groups conducted with artists. The committee also had made site visits to The Russell in Detroit, the Park Trades Center in Kalamazoo, and the Box Factory in St. Joseph. At that time, the committee had secured a donation that had allowed a grant writer to be hired, to help submit applications for several grants, but none had yet been secured, Esau reported. He said the next step would be to raise $100,000 for additional studies on the old buildings located at the site, which are protected by the Old West Side historic district. At the council’s most recent meeting on May 7, 2012, Esau’s update was less sanguine about his own group’s involvement. He characterized the group as having completed the work for the skills that are relevant to the Arts Alliance. The group had wanted to see a combination of different kind of spaces for artists and had generated preliminary layouts for the building. The result of that work suggested the building could house the activities that the Arts Alliance would like it to house, and that it could operate on a break-even basis. What was needed was a more sophisticated and detailed revenue/expense analysis, he said. Funding for grant writing had been arranged, Esau said. However, most foundations offering grants are limited in their scope, he said. Foundations offering grants often are not interested in funding bricks-and-mortar capital projects, especially not early-stage projects like the 415 W. Washington project. The group wound up applying for just one grant, and it turned out that for that grant as well, the kind of capital project the Ann Arbor group had in mind was not a good fit, even though that was not evident from the grant criteria. The balance of the money that had been donated to the group for grant-writing activity has been returned to the donor at the request of the donor, Esau reported. Esau told the council that if the city is serious about redevelopment of the building, there is money that needs to be spent now. Some of that money would be needed anyway – even if the building is demolished. The Arts Alliance still believes a shared arts facility has potential and could be beneficial. However, as supportive as the Arts Alliance is of the concept, that organization can’t continue to do work on the project without compensation. All their work thus far has been pro bono. He noted that a different arts group has emerged that has more experience in adapting existing structures and is interested in participating. With that, Esau handed over the presentation to Carl Goines, executive director of 555 Nonprofit Gallery and Studios. Goines sketched out the mission and history of the group, as it was founded in the Technology Center, where the Ann Arbor Y now stands, across the street from the 415 W. Washington site. Goines described three locations in Detroit that 555 currently operates, including the former 3rd police precinct building, with around 7,000 square feet, including jail cells. Goines said 555 was interested in working with greenway advocates to create complementary spaces – the greenway portion of the parcel and a building with space for artists. The first steps that Goines said need to be taken are: hazardous materials assessment ($5,200); Phase 2/3 environmental assessments ($20,000); topographic and boundary survey ($6,200); structural condition survey ($3,000 to $5,000); and architectural/structural as-built survey ($8,000). After those first steps, Goines said, the next steps would be: developing a hazardous materials abatement plan; doing a structural feasibility analysis; doing a more detailed analysis of programming and design feasibility; performing a site and environmental feasibility analysis; doing a cost analysis; forming partnerships; and fundraising. Mayor John Hieftje had introduced some of the history of the site before Esau and Goines addressed the council. When they concluded their remarks, Hieftje noted that 415 W. Washington is a city-owned site. The city needs to do something with it. He characterized it as a magnet for graffiti. Because it’s in the Old West Side historic district, the city can’t simply remove the building. The city would need to petition the city’s historic district commission, Hieftje said. He hoped that a proposal could be brought forward working with people who’ve done a similar project before – the 555 group. However, Hieftje cautioned that if something couldn’t be brought forward in a year, the task force would have to come back and say they haven’t been able to bring something forward, and a decision would need to be made at that time. A year from now, Hieftje remarked, the building won’t be in better shape than it is now. He echoed the remarks of Esau and Goines in noting that the expenditures they’d identified would need to be made anyway before tearing down the building. Sumedh Bahl, community services area administrator, explained that the annual deadline for Michigan Natural Resources Trust Fund grant applications is in April. Bahl reported that staff had looked at 415 W. Washington as the subject of a possible grant application, but had concluded there are a number of elements not yet in place – for example, “environmental closure” on the site. Colin Smith, the city’s parks and recreation manager, noted that a council resolution was passed on Aug. 4, 2011 expressing general support for the idea of a greenway. There have been conversations, he said, about applying for a grant from the Michigan Dept. of Natural Resources Trust Fund, to turn the 415 W. Washington site into a park. The city staff is looking into that. The process would be similar to the way that the trust fund application for the skatepark had been handled, Smith explained. Staff would first come to PAC for a recommendation to apply. That recommendation would be forwarded to city council, which would need to approve the application. Smith noted that one issue for the 415 W. Washington property is that it’s located in a historic district – the Old West Side. So in addition to PAC, the city would need a recommendation from the historic district commission too, he said. Finally, Smith reminded commissioners that the parks, recreation and open space (PROS) plan, which PAC approved, recommends that the first action should be development of a master plan to guide the creation of a greenway. That point bears consideration, he said. 415 W. Washington: What about 721 N. Main? At the council’s May 7 meeting, Bahl explained that because the city could not move quickly with a trust fund grant application for 415 W. Washington, staff were instead considering the city-owned 721 N. Main as a grant application. To apply to the trust fund, he explained, there would need to be environmental closure on the site, a budget and a plan. Even for 721 N. Main, he said, it’d be an aggressive time schedule, but he felt the city could manage it. All the planning work would need to be done by Jan. 1, 2013, he said, to have the application ready for the April 2013 deadline. It would need to be reviewed by the park advisory commission and the environmental commission. Also, community meetings would need to be held and a community consensus achieved. The introduction of the topic of the 721 N. Main property led to some confusion among councilmembers: Was the city considering applying for Michigan Natural Resources Trust Fund grants for 721 N. Main or 415 W. Washington, or possibly both? Back and forth between Jane Lumm (Ward 2), Hieftje, and Bahl established that the city would plan to try for an application on 721 N. Main in April 2013, and for 415 W. Washington the following year, in April 2014. Hieftje said that city staff say they won’t have the capacity to do both at the same time. Hieftje also indicated there’s a problem with the environmental conditions at 415 W. Washington. The city thinks it can meet the environmental standard at 721 N. Main. Hieftje also indicated that there’s some concern on the part of the city’s lobbyist in Lansing that the Natural Resources Trust Fund might not be as flush in coming years as it has been. In addition, Hieftje said, the Greenway Conservancy needs to have a park established as a part of the Allen Creek greenway so they can point to it, which will facilitate fundraising for additional acquisitions. Lumm agreed that both properties are key parcels. She ventured that many members of the city council would like to assist with the planning effort for the greenway, and noted that it involved asking city staff to invest the time to master plan the greenway. Bahl said that planning exercise would be a two-year effort. In his remarks on the 415 W. Washington presentation, Tony Derezinski (Ward 2) noted the relationship between the two parcels, saying a lot things are coming together at the same time. The 721 N. Main property is within the area of the North Main corridor task force, he said, which was an item later on the council’s agenda. Outcome: The council did not have a voting item on its agenda related to 415 W. Washington. 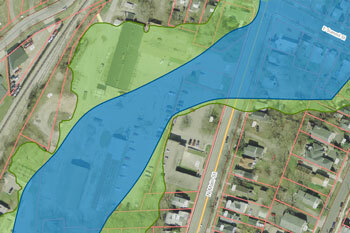 The council considered a resolution establishing a task force to study the corridor along North Main Street and the Huron River. In addition to the MichCon property, the resolution establishing the North Main/Huron River task force explicitly mentions another parcel – 721 N. Main. So there are two deadlines for the task force – an outcome that was decided only after confusion and much conversation by the council during its May 7 deliberations. 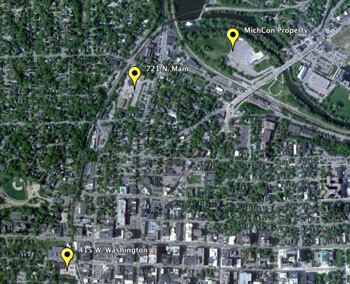 The earliest deadline is for a recommendation on the 721 N. Main property – by the end of 2012. The later deadline, for the overall report, is not until 2013, on July 31. Council deliberations on the 721 N. Main portion of the task force resolution had already begun in the context of the presentation on 415 W. Washington. At that point in the council meeting, it was already established that the 721 N. Main property would be put ahead of 415 W. Washington for consideration of a Michigan Natural Resources Trust Fund application. It’s the trust fund’s April 2013 application deadline that pushed the council to give the task force a Dec. 31, 2012 deadline for a recommendation on 721 N. Main. Some of the additional background on 721 N. Main, reviewed by community services area administrator Sumedh Bahl, included the fact that the city has received a grant from the Federal Emergency Management Agency (FEMA) to demolish two of the buildings – those in the floodway. The main building is in the floodplain, not the floodway, and is not included in the FEMA grant. Stephen Kunselman (Ward 3) asked if there was any intent to save the main building. Bahl said he didn’t know right now, but the FEMA grant is for the demolition of the other two buildings. 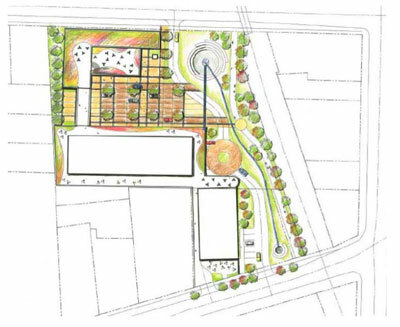 As funding sources for development of 721 N. Main as a greenway park, Hieftje gave another possibility in addition to the FEMA grant and the possible Natural Resources Trust Fund grant. Hieftje reported that he also had had a fruitful conversation with Washtenaw County parks and recreation on possible funding from that group. [The Washtenaw County parks and recreation commission operates with its own dedicated millage funds.] No formal agreement exists, Hieftje allowed, but the group was happy to see an application for funds go forward. By way of additional background, Bob Tetens – director of Washtenaw County parks and recreation – told The Chronicle in a recent phone interview that there was not anything yet in front of the parks and recreation commission related to 721 N. Main. He indicated that there’d been conversations with the city about the project, and that the idea of connecting the 721 N. Main property would be a good fit with the county parks and recreation Connecting Communities grant program – a $600,000 annual program over five years, for a total of $3 million. Tetens also said that a project already partly funded through another source (like the state’s Natural Resources Trust Fund) would enhance that project’s application for a Connecting Communities grant. However, there are more applications for various projects every year than Washtenaw County parks and recreation can fund through the program, Tetens said. Hieftje commented that he’s hopeful about a railroad underpass, because the Michigan Dept. of Transportation would be soon be acquiring the tracks from Norfolk Southern Railway. Railroad are notorious for being difficult to work with, he said. Hieftje felt that MDOT should be easier to work with than Norfolk Southern. Bahl responded to Hieftje’s speculation by saying that MDOT might be easier to work with than the Norfolk Southern, but said that working with MDOT is no piece of cake. Bahl’s sentiments were consistent with those expressed by city staff on a March 16, 2012 staff-led tour of the area around the MichCon site and the Broadway bridges. Responding to residents who ventured that MDOT would be easier to work with, city engineer Michael Nearing and city transportation program manager Eli Cooper were both keen to stress that MDOT would not be easy to work with on railroad issues. Sandi Smith (Ward 1) led off the deliberations on the task force resolution. She co-sponsored it with her wardmate, Sabra Briere. She highlighted the fact that it’s meant to be a collaborative effort to look at the North Main corridor along the Huron River. She noted that access to Bandemer Park was difficult – for pedestrians, bicyclists and cars. None of it is being done very well currently, she said. So people use the illegal cut-throughs across the railroad tracks. The city has given up maintaining a fence there, because it was destroyed so many times, she said. But across the railroad tracks is the only way into Bandemer, unless you go up North Main and cross the tracks at the at-grade crossing. Almost everyone takes the illegal shortcut, she noted. The city is investing a lot of resources in that general area. The Argo Cascades bypass around the Argo Dam has doubled or tripled the number of visitors to the area. People are flocking to it, she said. A connection between 721 N. Main and Bandemer will serve the greenway very well, she said. Getting to the Huron River from that side of the railroad tracks needs to be addressed, she said. In his remarks, made later in the deliberations, Mike Anglin (Ward 5) noted that Smith had served on the Allen Creek greenway task force that had produced the 2007 report. It had a lot of technical detail that’s very deep, he noted. The participation of the greenway conservancy would be an asset, he said. Tony Derezinski (Ward 2) said the task force effort ties in with efforts that had been discussed two years ago. He noted that he and Smith had walked the area to see what the North Main entrance into the city looks like. He said he’d support the resolution as an idea whose time has come. Briere noted the difference between the work of the task force and the work that city staff would do. She observed that members of the task force are individual citizens, not staff members. She continued by saying she is partial to the resolution language that says the task force will conduct a series of workshops and would work with independent professionals – to help everyone listen to ideas they might not think of inside the box they live in. She stressed that the task force membership includes people who have a real stake in the area. She also stressed that anyone who wanted to attend the task force meetings would be welcome to do so. Marcia Higgins (Ward 4) indicated she supported the resolution. But she wanted to know how the work would be funded. Briere indicated the task force would have access to one staff member – Sumedh Bahl. Most of the work would be done by people who don’t get paid. So Higgins ventured that the independent professionals the task force was supposed to consult with would be volunteers – yes, said Briere. A lengthy discussion then ensued about the work that the task force would do on 721 N. Main, compared with the staff work that would be done specifically in connection with preparing to meet the April 2013 application deadline for the Michigan Natural Resources Trust Fund. 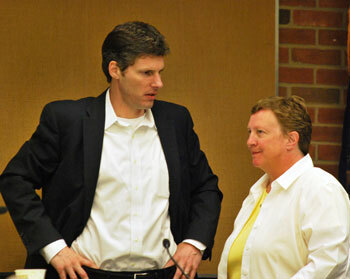 Carsten Hohnke (Ward 5) and Sandi Smith (Ward 1) before the May 7 council meeting. Bahl indicated that the initially proposed deadline for the task force recommendation on 721 N. Main (which had been March 31, 2013) would be much too late to make a difference for the April grant application. That deadline was revised to Dec. 31, 2012. Christopher Taylor (Ward 3) expressed some concern that even that earlier deadline would not give city staff enough time to prepare the grant application. Bahl assured Taylor that the site plan that would be produced in connection with the grant application would be only at the conceptual level, indicating that the deadline would be achievable. Hieftje stressed that the best thing from the point of view of pushing a greenway forward is to get the funding for 721 N. Main, so that the first of a series of greenway parks could be established. That would be the best approach to establishing 415 W. Washington as part of an Allen Creek greenway, he said. Carsten Hohnke (Ward 5) thanked Briere and Smith for developing the resolution and bringing it forward. He counted it as significant progress since the greenway task force had submitted its report. He also noted that progress had been made on the First and William lot. Hohnke felt that progress was now being made on the other two city-owned parcels [identified by greenway advocates as three key parcels for an Allen Creek greenway.] Hohnke noted that part of the challenge of the First and William site is environmental remediation. Outcome: The council unanimously approved establishing the task force to develop a vision for North Main/Huron River. Appointments to the task force could come as soon as the next council meeting on May 21. In addition to eventual appointments to the North Main/Huron River task force, at its May 7 meeting the council considered appointments to two park-related bodies of the city: the park advisory commission, and the greenbelt advisory commission. The council considered the nomination of Ingrid Ault to the city’s park advisory commission (PAC). Ault – executive director of the nonprofit Think Local First – replaces Gwen Nystuen, who served two three-year terms on the commission starting in 2006. Service on the commission is limited to six continuous years at a time – but an additional appointment can be made after a three-year pause. During the council’s opportunity to deliberate on the appointment, Jane Lumm (Ward 2) spoke at length in praise of Nystuen’s service to the city on PAC. Outcome: The council unanimously approved Ault’s nomination to the city’s park advisory commission. A parliamentary snafu was associated with the nomination for re-appointment of two members of the city’s greenbelt advisory commission (GAC), which is charged with overseeing a portion of the proceeds from the open space and parkland preservation millage. By administrative policy, two-thirds of the millage proceeds are invested in land preservation outside the city – GAC makes recommendations to city council for those investments. The other third of the money is overseen by the land acquisition committee of PAC, which also acts in an advisory capacity to city council. The re-appointment of Catherine Riseng and Peter Allen to GAC was on the agenda as a voting item, but was supposed to be a communication. The council agreed informally to postpone the vote until its following meeting, on May 21. Christopher Taylor (Ward 3) raised the corresponding point of order – the council should actually vote on the postponement as a matter of form, which the council then did. Outcome: The council unanimously postponed the reappointment of Riseng and Allen to GAC. Also a part of the North Main/Huron River task force scope of work is the MichCon site, bounded roughly by the railroad tracks next to the Amtrak station on the west, the Huron River on the east, and Broadway bridges on the south. At an April 10, 2012 public hearing held at Cobblestone Farm, Shayne Wiesemann, a senior environmental engineer with DTE Energy, spoke to The Chronicle about the cleanup. He explained that the cleanup of the area next to the river was the subject of the hearing, not the cleanup for the entire site. While the standards for remediating the riverside strip had essentially been determined, that was not the case for the entire site. The cleanup standard that DTE Energy would meet for the entire site would depend on its eventual planned use by a future owner, Wiesemann said. He indicated that the MichCon leadership is interested in selling the property – but does not have an immediate sense of urgency to dispose of the land. He indicated that something like a five-year time frame would be appropriate to think about. Mayor John Hieftje and others have spoken about their desire to see the land acquired by the city and become a park. One possible source of funds for acquisition of at least part of the parcel by the city would be the open space and parkland preservation millage. That purchase would need to be recommended by the park advisory commission’s land acquisition committee. In a recent phone interview with The Chronicle, Allen described how the “buildable” portion of the property is closer to the Broadway bridges, and that he could imagine the parcel as including parkland as well as developed property. He highlighted in particular the possibility of including a performing arts venue at the location. Allen teaches a course in urban planning as an adjunct professor at the University of Michigan. Two and a half years ago, The Chronicle reported on a class assignment that Allen gave students to look at the potential development of various sites around Ann Arbor. Two groups of students took on the challenge of evaluating the MichCon property as developable land. 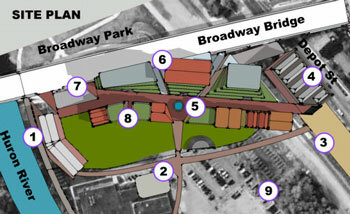 The two projects were called Broadway Mills and NoMo. Both proposals include construction of buildings on the eastern part of the parcel, leaving the western portion as open space. Outcome: The council did not have a voting item on its agenda regarding the MichCon property. The Chronicle could not survive without its own “greenway” of voluntary subscriptions to support our coverage of public bodies like the Ann Arbor city council. Click this link for details: Subscribe to The Chronicle. And if you’re already supporting us, please encourage your friends, neighbors and colleagues to help support The Chronicle, too! You are allowed to vote every 24 hours. The city of Dearborn choose a station site farther away from their primary employer Ford Motor and closer to their major tourism draw and the westside downtown area. The Michcon site could provide a similar opportunity here in Ann Arbor to expand the current station, linking with parkland and the downtown area, as a much more appropriate “gateway” to Ann Arbor.